Main Stage at Sonisphere Festival in Kirjurinluoto, Pori, Finland. The idea for Sonisphere was first conceived by John Jackson in the late 90s. John chose the name Sonisphere, from a combination of Sonic and Sphere. In 2008 Stuart Galbraith had formed business partnership with AEG Live called Kilimanjaro Live. John Jackson approached Stuart Galbraith with the idea of a Pan-World touring festival which fit in with plans Kilimanjaro Live had to launch a UK festival. John Jackson is the Creator and Director of Sonisphere and Galbraith the Producer. The first run of festivals ran throughout the summer of 2009 at six venues, returning in 2010 and 2011 with 11 venues. Plans for future festivals consist of increasing the number of festivals, making the event global rather than local to Europe, expanding the UK event into a 3-day festival, and increasing the UK capacity from 40,000 to 60,000 attendees. The 2009 Sonisphere festival tour was made up of six one-day festivals across Europe with a seventh festival in England spanning two days. The festival had a core group of bands that played each of the six dates with numerous extra bands added to each date individually. The locations for the 2009 festivals include Goffert Park, Nijmegen, Netherlands; Hockenheimring, Germany; The Forum, Barcelona, Spain; Folkets Park, Hultsfred, Sweden; Kirjurinluoto, Pori, Finland; and Knebworth House, Knebworth, England. Metallica were the main headliners for each of the 2009 Sonisphere Festivals. The Dutch edition of the Sonisphere Festival took place on Saturday 20 June 2009 at Goffertpark in Nijmegen. Mastodon could not make it to Sonisphere due to scheduling issues. This was announced at Sonisphere itself, although some[weasel words] heard the news whilst traveling. The Sword cancelled their show a few days before Sonisphere began. The German edition of the Sonisphere Festival took place on Saturday 4 July 2009 at Hockenheimring with Metallica as headliners. The Spanish edition of the Sonisphere Festival took place on Saturday 11 July 2009 at The Forum, Barcelona with headliners Metallica. The Swedish edition of the Sonisphere Festival took place on Saturday 18 July 2009 at Folkets Park, Hultsfred with Metallica as headliners. Linkin Park performing at Sonisphere Festival in Kirjurinluoto, Pori, Finland. The Finnish edition of the Sonisphere Festival took place on Saturday 25 July 2009 at Kirjurinluoto Arena, Pori with Metallica as headliners. Machine Head were forced to cut their set short, due to lead guitarist Phil Demmel collapsing on stage. The British edition of the Sonisphere Festival took place over two days, on Saturday 1 and Sunday 2 August 2009, at Knebworth House, Knebworth with headliners Linkin Park (Saturday) and Metallica (Sunday). The festival featured four stages of music over the weekend, with the main two being staggered staging, the others being within the Bohemia village. The Bohemia stage (the third of four stages) was an undercover stage and was able to continue past the sound curfews placed upon the main stages. This was The Rev's final live performance as Avenged Sevenfold's drummer before his death in December 2009. It was also the last European appearance of Ronnie James Dio before he died of stomach cancer in May 2010. Dead by Sunrise appeared on the Apollo Stage on the Saturday night as part of Linkin Park's encore. Coheed and Cambria were late arriving, due to them missing their ferry and as such were moved onto the Bohemia stage to play a later slot originally intended for the band FACT. As such, FACT played the Apollo stage. Lamb of God's guitarist Mark Morton missed the band's slot on 2 August as his wife was due to give birth around that time. Unearth's Buz McGrath filled in for him for the band's show at Sonisphere UK. Nine Inch Nails performance was said to be their last ever in Europe as they were set to stop touring at the end of that tour after 20 years. Ultimately the resumed touring, returning to the UK in 2013 at Reading and Leeds festivals and playing several dates in the UK in May 2014. Thunder played their last ever set as well after 20 years of performing. Anthrax played what was billed as a one-off show with former vocalist John Bush as the originally intended vocalist, Dan Nelson, was no longer part of the band. Machine Head pulled out when Limp Bizkit's addition bumped them down the bill; however, they did return to play the fourth slot on the Apollo stage as Special Guests. Frank Turner pulled out for undisclosed reasons, though he has claimed to fans that he was forced to choose between this festival and Leeds and Reading festivals, ultimately choosing the latter. Fear Factory cancelled tour dates for what they claimed to be recording of a new album, but was ultimately found out to be legal disputes over the use of the name Fear Factory. Thin Lizzy pulled out as the band parted ways with guitarist-vocalist John Sykes. Dirty Little Rabbits pulled out before the festival due to their drummer suffering from exhaustion after months of touring with Slipknot. The Ataris pulled out after one of their members contracted swine flu. The Sonisphere 2010 tour visited eleven locations around Europe between 16 June and 8 August 2010. The locations for Sonisphere 2010 were Poland, Switzerland, Czech Republic, Bulgaria, Greece, Romania, Turkey, Spain, United Kingdom, Sweden and Finland. Unlike in 2009, there was not a full touring headliner performing each date. The headliners for 2010 were Iron Maiden, Metallica and Rammstein. Warsaw, Poland was the host city for the first of the 2010 festivals; that was first announced on 9 December 2009. The 2010 Sonisphere in Poland took place on 16 June 2010. Metallica, Megadeth, Slayer and Anthrax, bands which make up the big four of thrash metal, played together for the first time. Switzerland was the second nation to host the Sonisphere festival in 2010 with the event taking place at Degenaupark in Jonschwil on 18 June 2010. Czech Republic hosted the festival in Milovice on 19 June 2010; this was also a one-day festival. Metallica headlined this event. Bulgaria held its first Sonisphere over two days in Sofia on 22 and 23 June 2010. The venue was the Vasil Levski National Stadium. This concert was also broadcast live around the world in movie theaters as part of the Big Four Tour. This was the first time in their history that all four bands played together on one stage, performing the Diamond Head song "Am I Evil?". The Sonisphere festival in Greece was held on 24 June 2010 at Terra Vibe Park in Athens in front of 30,000 people. Romania held the Sonisphere festival from 25 to 27 June 2010 in Bucharest at Romexpo. Turkey held the Sonisphere festival at the same time as Romania: 25 to 27 June 2010. This part of Sonisphere was at the BJK İnönü Stadium in Istanbul. Akbank sponsored the event. The Big Four were on the stage one after another, but did not play altogether. This was the first time Rammstein and Anthrax came to Turkey. The bass player of Manowar, Joey DeMaio, made a speech to the audience in Turkish. Spain hosted Sonisphere on 9 and 10 July 2010, at Getafe Open Air in Madrid. Sonisphere arrived in the UK for a three-day festival, taking place at Knebworth House between Friday 30 July – Sunday 1 August. Music included a 'Rocky Horror Show theme with Alice Cooper, and headliners Iron Maiden and Rammstein. Outcry Collective pulled out due to the band breaking up. Municipal Waste pulled out due to exhaustion and injury. Slayer performing at Sonisphere Festival, Stockholm, Sweden 2010. Sweden hosted Sonisphere in Stockholm on 7 August 2010 for a one-day festival. Iron Maiden announced via their official website that the band would headline the Swedish event. The following bands performed at the event. Heaven & Hell cancelled due to Ronnie James Dio's illness and later death. Sonisphere finished its tour in Finland, where tickets sold out in 2009. It was held on 7 and 8 August 2010, at Kirjurinluoto Arena Pori. Iron Maiden and HIM headlined the event. 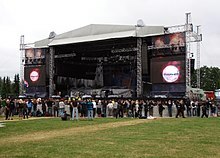 A freak storm hit Sonisphere in Finland on Sunday 8 August 2010, causing severe damage to the second stage, rendering the stage unsafe and unusable. Two people were seriously injured and one died in hospital. The Heaven & Hell show was cancelled before the beginning of the festival due to Ronnie James Dio's health issues. He died on 16 May 2010. Sonisphere returned in 2011 with new venues in India, France and Italy but did not return to Romania. It also marked the first time that Metallica played in India. The first headliner announced for Knebworth, England was Slipknot. Sonisphere Knebworth took place from 8 to 10 July 2011. On 3 December 2010, it was announced that the American band Slipknot would headline Sonisphere 2011. Soon afterward, on 6 December it was announced that Scottish rock band Biffy Clyro would be headlining the Saturday night, in the band's first major festival headlining performance. On 13 December 2010, it was announced that Metallica, Megadeth, Slayer and Anthrax would headline the Friday of the Knebworth event. This will be the first time that The Big Four perform together in the UK. On 17 January 2011, it was announced that Motörhead, Mastodon, In Flames and Parkway Drive will be playing the UK leg of Sonisphere. On 31 January 2011, it was announced that Weezer, Airbourne, Architects and Diamond Head will be playing Sonisphere. On 28 February You Me at Six, All Time Low, Sum 41, House of Pain, Arch Enemy, Grinspoon, Fozzy and Periphery were added to the lineup. On 28 March Bill Bailey, Jarred Christmas, Jason John Whitehead, Jim Breuer, and Steve-O were added to the lineup. According to the official site, during all three days of event, nearly 190,000 people were present. Cancer Bats performed a Black Sabbath tribute show. Motörhead dedicated their set to their former guitarist Würzel who died just the day before. Sonisphere in Sweden returned to Stockholm, but it was held at "Globen Open Air" on Saturday 9 July 2011. Slipknot headlined the event, with In Flames, Mastodon, Mustasch and Dead by April also playing at the festival. Only 16,000 fans came to see the bands this time. Sonisphere in Finland took place at Kalasatama, Helsinki on 2 July 2011. Slipknot headlined the bill with the other bands performing included: In Flames, Opeth, Sonata Arctica, Hammerfall, Mastodon and more. As opposed to past two years, the 2011 Sonisphere was less well attended, with attendance of only 12,000 fans. Sonisphere Poland returned to Bemowo Airport, Warsaw on Friday 10 June 2011. Iron Maiden announced on their website that they would headline the event in Poland in 2011. Motörhead was confirmed as the second headliner of the festival. Other bands announced were Mastodon, Volbeat, Killing Joke, Devin Townsend, Hunter and Made of Hate. Iron Maiden played to the crowd of over 40,000 people who attended the event. Sonisphere in Greece returned to Athens and it took place in Terra Vibe Park, Malakassa on Friday 17 June 2011. Iron Maiden headlined the event, and Slipknot were special guests, playing live for the first time since Paul Gray's death. Mastodon, Gojira and Virus were the supporting acts. On 6 May it was announced that Nightfall, Moonspell, Need and Total Riot would play on 17 June 2011. Rotting Christ were the headliners of the second stage of the Greek leg of Sonisphere Festival. More than 25,000 fans attended the event. Sonisphere 2011 took place on Italian soil for the first time. More than 40,000 people were present during two days of festival. The two-day event was booked at the Autodromo Enzo e Dino Ferrari in Imola, on 25 and 26 June 2011. Iron Maiden were the headliners on the first evening, and the band performed to nearly 30,000 fans. Next day's headliners were Linkin Park with 13,000 in attendance. The other bands on the bill were: Slipknot, My Chemical Romance, Sum 41, Alter Bridge, The Cult, Mastodon, Motörhead, Guano Apes, Funeral for a Friend, Papa Roach, Rob Zombie, Apocalyptica and many others. On 1 May 2011, Metallica confirmed on their official website that they would headline the Indian edition of Sonisphere, which took place in Bangalore on 30 October at the Palace Grounds. The third Spanish Sonisphere Festival took place on 15 and 16 July 2011, at Getafe Open Air in Madrid. The main headliner was Iron Maiden with The Darkness and Slash headlining the night before. Sonsphere Spain included around 70,000 attendees. Iron Maiden played to a full house venue with nearly 45,000 fans. Iron Maiden headlined the second Turkish Sonisphere show, which took place on 19 June 2011, at Maçka Küçükçiftlik Park, Istanbul. Other bands that played included Slipknot, Alice Cooper, Mastodon and In Flames. Tickets were sold to approximately 25,000 people. A Sonisphere event was scheduled to happen this year in Bulgaria but according to local promoter Marcel Avram and Balkan Entertainment the event was cancelled due to logistical and other problems that could not be rectified. The promoters also said that these problems were out of their control and that full refunds for tickets would begin on 15 June and continue to 15 July. Sonisphere returned to Switzerland for the second time. The event took place at St. Jakob on 23 and 24 June in Basel. Over two evenings more than 35,000 people attended the headlining shows. 23 June headliner was Judas Priest with the Epitaph World Tour at the St. Jakobshalle; the next evening's headliner was Iron Maiden, who performed to almost 25,000 fans gathered at Leichtathletik Stadion. The other bands were: Whitesnake, Alice Cooper, Slipknot, Limp Bizkit, In Extremo, In Flames, Papa Roach, Kreator, Mr. Big, Hatebreed, Hammerfall, Alter Bridge, Gojira, Gwar, Skindred and many more. For the second time, Sonisphere took place in Czech Republic. The 2011 event was originally scheduled for Milovice Airport, but after a few months was changed to Praha's Výstaviště Park. Nearly 30,000 people from Czech Republic and many other countries (Poland, Germany, Austria) attended the headlining gig of Iron Maiden on 11 June 2011. Other bands on the bill included The Sisters of Mercy, Kreator, Korn, Mastodon, Cavalera Conspiracy and many others. Sonisphere Knebworth was scheduled to take place from 6 to 8 July 2012. On 20 February 2012, the headliners were announced as Kiss (Friday), Queen + Adam Lambert (Saturday) and Faith No More (Sunday). Several bands were set to play an album in its entirety, including Mastodon performing The Hunter, Glassjaw performing Worship and Tribute and Hundred Reasons performing Ideas Above Our Station. On 29 March the festival was cancelled with the organisers stating that co-ordinating the festival to an appropriate standard this year had proved more difficult than expected. Poland hosted Sonisphere on 10 May 2012, at Bemowo Airport. Spain hosted Sonisphere on 25 and 26 May 2012, at Getafe Open Air. Switzerland held Sonisphere on 30 May 2012, at Yverdon-les-Bains. Finland held Sonisphere on 4 June 2012, at Kalasatama. France held Sonisphere on 7 and 8 July 2012, at Amneville. In December 2012, organisers announced the festival would make a return after cancelling that year's edition in Knebworth. However, on 21 December it was confirmed the event would be cancelled for the second year in succession. Citing a struggle to secure a strong lineup for the festival. It was announced on 12 November 2013, that Sonisphere would return to Knebworth, UK, from 4 to 6 July 2014. The festival would celebrate 40 years of Rock Music at Knebworth Park. Sonisphere would come to Hamburg, Germany on 4 June 2014. On 2 December Iron Maiden (Saturday) and Metallica (Sunday) were announced as the first two headliners of the UK edition of Sonisphere. This would be Iron Maiden's final show of their highly successful Maiden England World Tour. It was also revealed when Metallica were announced, that fans booking weekend tickets would be eligible to vote for 17 of the 18 songs in Metallica's setlist (The 18th to be one of their new songs). On 11 December The Prodigy were announced to be headlining the Friday slot. On 6 January, Slayer, Mastodon, Alice in Chains, Ghost, Karnivool, Gojira and Airbourne were added to the lineup as undercard bookings. Then on 21 January, Limp Bizkit were revealed to be the special guests for The Prodigy on the Friday, with Dropkick Murphys, The Sisters Of Mercy, Anthrax, Chas & Dave, The Devin Townsend Project, Carniflex, Silverstein, The Virgin Marys & Voodoo Six also appearing across the weekend. For the first time at a UK festival, the pro wrestling company Progress Wrestling held three shows at The Satellite Stage on all three days. The shows were well received and considered on many music sites "Best at Sonisphere 2014", especially after a "Lego Deathmatch" was held on the final night. Sonisphere also later revealed on their official Facebook page, that they plan to continue their tradition of having no stage clashes between the two main stages (Apollo & Saturn stages), but the other stages would run as normal. Babymetal would make their first ever UK appearance on the Apollo Stage on Saturday 5 July 2014. Italy held Sonisphere on 2 June 2015, at Assago Summer Arena. Switzerland held Sonisphere on 6 June 2015, at ExpoPark Nidau-Biel. Sonisphere UK 2015 was cancelled in January 2015 after the organisers stated they couldn't get a line-up together they deemed suitable for the event. Switzerland held Sonisphere on 3 and 4 June 2016, at Allmend in Lucerne. On 8 January the official Sonisphere Facebook page replied to a user, on a picture that they shared, stating: "We don't have a festival that I am aware of". Sonisphere did not take place in Knebworth despite organisers stating a desire to return. Wikimedia Commons has media related to Sonisphere. ^ Foster, Patrick (9 February 2009). "British leg of rolling tour sees Knebworth ready to rock again, just like the Seventies". The Times. London. Retrieved 23 May 2010. ^ "It doesn't make sense to run Sonisphere in the UK". Music Week. 6 February 2018. Retrieved 16 June 2018. ^ "Interview with Stuart Galbraith, pages 14 and 15". Archived from the original on 29 December 2012. ^ "Sonisphere Netherlands 2009 Setlists". setlist.fm. ^ "Sonisphere Germany 2009 Setlists". setlist.fm. ^ "Sonisphere Spain 2009 Setlists". setlist.fm. ^ "Sonisphere Sweden 2009 Setlists". setlist.fm. ^ "Sonisphere Finland 2009 Setlists". setlist.fm. ^ "Sonisphere UK announce 3 stages". Archived from the original on 29 December 2012. ^ "Lamb of God's Morton to miss Sonisphere". Archived from the original on 29 December 2012. ^ "Bohemia Stage Headliners pull out". Archived from the original on 29 December 2012. ^ "Blabbermouth.Net". Roadrunnerrecords.com. Archived from the original on 29 December 2012. Retrieved 11 November 2010. ^ "Sonisphere Poland 2010 Setlists". setlist.fm. ^ "Metallica, Slayer, Megadeth, Anthrax were confirmed for Sonisphere in Switzerland". ^ "Sonisphere Switzerland 2010 Setlists". setlist.fm. ^ "Sonisphere Czech Republic 2010 Setlists". setlist.fm. ^ "Sonisphere Bulgaria 2010". Sonisphere Bulgaria 2010. Archived from the original on 29 December 2012. Retrieved 4 March 2010. ^ "Sonisphere Bulgaria 2010 Setlists". setlist.fm. ^ 'The Big Four: Live From Sofia, Bulgaria': New DVD Trailer Released Archived 29 December 2012 at WebCite blabbermouth.net. 21 September 2010. Retrieved on 2010-10-01. ^ "Concerts – Sonisphere Festival: Metallica, Slayer, Megadeth, Anthrax, Bullet For My Valentine, Stone Sour, Suicidal Angels – Terra Vibe, Malakasa, Greece". Rockpages.gr. 24 June 2010. Archived from the original on 29 December 2012. Retrieved 11 November 2010. ^ "Sonisphere Greece 2010 Setlists". setlist.fm. ^ "Sonisphere Romania 2010 Setlists". setlist.fm. ^ "Sonisphere Turkey 2010 Setlists". setlist.fm. ^ "Sonisphere Spain 2010 Setlists". setlist.fm. ^ "Sonisphere UK 2010 Setlists". setlist.fm. ^ "Sonisphere Sweden 2010 Setlists". setlist.fm. ^ "Storm Victim Dies of Injuries | News | YLE Uutiset". yle.fi. Retrieved 11 November 2010. ^ "Sonisphere Finland 2010 Setlists". setlist.fm. ^ Bhamra, Satvir. Sonisphere 2011 Knebworth dates announced Archived 29 December 2012 at WebCite amplified.tv. 18 November 2010. Retrieved on 2010-11-18. ^ "Page Not Found". Archived from the original on 29 December 2012. Retrieved 21 July 2017. ^ Bharma, Satvir. The Big 4 to headline Sonisphere Knebworth Archived 29 December 2012 at WebCite amplified.tv. 13 December 2010. Retrieved on 2010-12-14. ^ Sonisphere Festival UK "Archived copy". Archived from the original on 29 December 2012. Retrieved 7 November 2012. CS1 maint: Archived copy as title (link) Sonispherefestivals.com 17 January 2011. Retrieved on 2011-01-17. ^ "4 more bands added to Sonisphere lineup". Archived from the original on 29 December 2012. ^ Davies, Alan. Eight more added to Sonisphere 2011 Festival at Knebworth whtimes.co.uk. 28 February 2011. Retrieved on 2011-03-08. ^ Bhamra, Satvir. Bill Bailey to headline Sonisphere Archived 29 December 2012 at WebCite amplified.tv. 28 March 2011. Retrieved on 2011-03.29. ^ "Sonisphere Sweden 2011 Setlists". setlist.fm. ^ "Sonisphere Finland 2011 Setlists". setlist.fm. ^ "IRON MAIDEN TO HEADLINE SONISPHERE FESTIVAL IN POLAND". Iron Maiden official website. 14 December 2010. Retrieved 17 December 2010. ^ "Iron Maiden to headline! Motörhead the second star of Sonisphere Festival 2011". Sonisphere Poland official website. 20 December 2010. Archived from the original on 23 December 2010. Retrieved 20 December 2010. ^ "IRON MAIDEN TO START SONISPHERE FESTIVAL IN POLAND". Iron Maiden FC. 14 June 2011. Archived from the original on 29 December 2012. Retrieved 16 June 2011. ^ "Sonisphere Poland 2011 Setlists". setlist.fm. ^ Metal Traveller Metallica at Sonisphere France comcert review MetalTraveller.com 20 January 2014. Retrieved on 2011-07-25. ^ "Page Not Found – Metallica – Page Not Found – Metallica". www.metallica.com. Archived from the original on 29 December 2012. Retrieved 21 July 2017. ^ Sonisphere Bulgaria 2011 Cancelled Archived 29 December 2012 at WebCite bg.sonispherefestivals.com. 14 June 2011. Retrieved on 2011-06-14. ^ "Sonisphere festival cancelled". sonisphere. Archived from the original on 22 November 2012. Retrieved 29 March 2012. ^ "Sonisphere Spain 2012 Setlists". setlist.fm. ^ "Sonisphere Switzerland 2012 Setlists". setlist.fm. ^ "Sonisphere Finland 2012 Setlists". setlist.fm. ^ "Sonisphere UK rock festival is cancelled for 2013 – BBC Newsbeat". 21 December 2012. Retrieved 21 July 2017. ^ "LINE UP POSTER". Sonisphere Festival UK. 7 May 2014. Archived from the original on 11 August 2014. Retrieved 9 May 2014. ^ "BABYMETAL World Tour 2014 Live Schedule". BABYMETAL.jp. BABYMETAL. Retrieved 9 May 2014. ^ "BABYMETAL Tour Dates". BABYMETAL Official. 7 May 2014. Retrieved 9 April 2014. ^ "UK Brace for BABYMETAL". Sonisphere Festival UK. 8 April 2014. Archived from the original on 17 August 2014. Retrieved 9 April 2014. ^ "Sonisphere Italy 2015 Setlists". setlist.fm. ^ "Sonisphere Switzerland 2015 Setlists". setlist.fm. ^ "No Sonisphere Knewborth in 2015 « Sonisphere Festival UK". Sonisphere Festival UK. 16 January 2015. Archived from the original on 20 January 2015. Retrieved 18 January 2015. ^ "Sonisphere Switzerland 2016 Setlists". setlist.fm. ^ "Sonisphere Festival". www.facebook.com. Retrieved 21 July 2017.